To study the complex nature and interactions between optionsStock OptionA stock option is a contract between two parties which gives the buyer the right to buy or sell underlying stocks at a predetermined price and within a specified time period. A seller of the stock option is called an option writer and the underlying asset, we present an options case study. It’s much easier to learn the use and payouts of options when we see it in practice. Firstly, however, let us briefly discuss the characteristics of the two main options. An option is a derivative contract purchased, mostly alongside the underlying asset. The option contract gives the buyer the right to purchase or sell the underlying asset from or back to the option writer at a specified price. The option holder is not obligated to exercise the option, and may let it expire if market conditions are not profitable for exercise. The strike price is the price of the underlying asset at which the option holder can exercise their option to buy or sell a specified amount of the underlying asset. The volume is the amount of the underlying shares to be traded on exercise of the option. Options may also be American or European options. These descriptors have nothing to do with the location of the option (an American option may be purchased in a European exchange). Briefly, an American option is exercisable before and up to expiry. A European option is only exercisable on expiry. A call option is the right for the option holder to buy the asset. The option is so called because it gives the holder the ability to “call” the asset. The option holder will purchase the agreed amount of the asset at the strike price. A call option rises in value when the value of the underlying asset increases to above the strike price of the option. This is because the option then gives the holder the right to purchase the asset at a lower price than the current market price. A put option is the right for the option holder to sell or “put” the asset back into the market. The option holder receives x amount of the asset in exchange for the strike price. The put option value rises when the value of the underlying asset drops below the option strike price. This is because the option holder is now able to sell the asset at a higher price than the current market price. Options also have a characteristic known as moneyness. When the market price equals the strike price on either type of option, it is known as at the money. 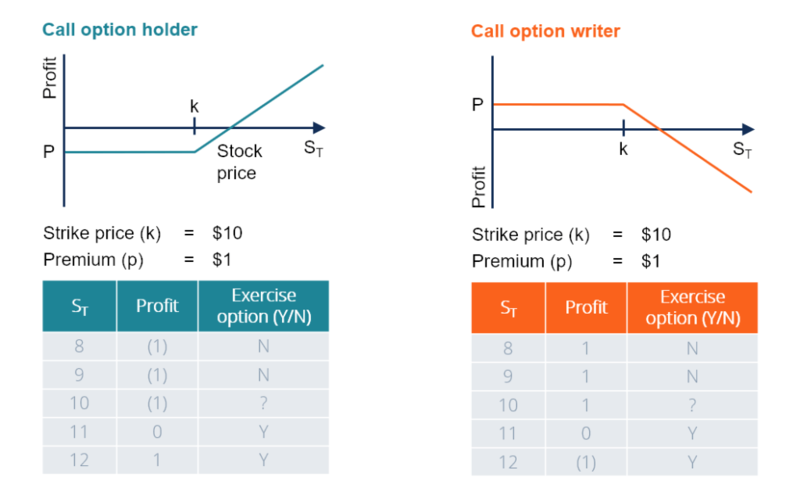 An option with a strike price where exercise would be profitable is known as an in the money option. Conversely, an out of the money option will result in a loss if exercised. Let us examine the case of a firm that’s concerned about the rising prices of a specific input. To make things easier, we discuss a plastic manufacturer concerned about the rising prices of oil. The market is currently at $25 per barrel. The manufacturer is afraid of the market rising above Bullish and BearishProfessionals in corporate finance regularly refer to markets as being bullish and bearish based on positive and negative price movements. A bear market is typically considered to exist when there has been a price decline of 20% or more from the peak, and a bull market is considered to be a 20% recovery from the bottom$30 per barrel. To remedy this issue, the manufacturer will purchase a call option at $30 per barrel. The call option strike price is equal to the forecast threshold the manufacturer fears. On purchase of the call option, the manufacturer (the option holder) pays a premium to the option writer. These premiums are dictated by the options market, and are affected by the strike price and volume on the option contract. If the market never exceeds $30 per barrel, the option expires out of the money. However, the manufacturer is not at a large loss, as they are able to let the option expire and simply purchase the oil on the market at below the $30 threshold. The loss on the option (excluding expected gains/loss on the oil purchase) is simply the premium paid to the writer. If the market stabilizes at $30 per barrel and remains there, the option expires at the money. The option holder can exercise the option or let it expire. This is arbitrary, as either way the manufacturer will purchase oil at $30. Here, the loss on the option is still simply the premium paid to the writer. If the market exceeds $30 per barrel, however, the option expires in the money. The option holder begins to make a profit on the option. If, for example, the market is at $33, the manufacturer will exercise the option and purchase oil from the writer at $30 per barrel. The option holder makes a profit of their savings less the premium paid. In this case, if the premium is $1, the profit is $2. This is found by ($33 – $30) – $1. Thus, they are protected against the price of oil going above $30, since their option profits will at least partially defray the additional cost of purchasing oil. In our example, the call option is used as a hedge against the oil market. The interaction of the call option is the same regardless of the market. In our example, we see that the out of the money option limits the downside for the plastic manufacturer to the premium paid on the option ($1 in our case). The downside exists for all market prices up to and including the strike price plus premium. However, if the market price exceeds the strike price plus premium, the manufacturer begins to profit. This profit/upside is unlimited. In summary, the plastic manufacturer successfully hedges against a feared rise in oil prices. The purchase of a call option limits the downside to the price of the premium, but does not lock in the upside, keeping it unlimited.